One of my earliest memories of home-grown tomatoes was from my Italian grandmother’s garden in the heart of Philadelphia. She grew tomatoes in large containers since backyards in the city are paved. Her tomatoes were in good company with her herb garden and her magnificent roses. So whether you have a large garden on just a terrace you can grow tomatoes. In a relatively small space you can produce 8 to 10 pounds of tomatoes. Select soil that is slightly acid and purchase a fertilizer that is recommended for tomatoes. Choose a stake or a cage to support your plants. Plant your staked tomatoes 2 feet apart in rows and an additional foot for caged plants. 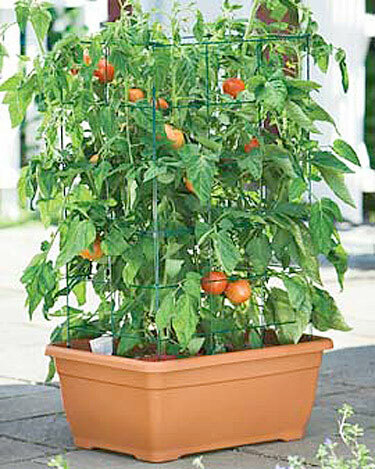 If your planting in a container I recommend Tomato Growing Kit from Gardeners.com. Staked plants should be pruned and tied loosely with soft twine. Once your plants are set, mulch to prevent weeds. Keep the soil moist around the roots so the tomatoes won’t wilt.